“OK, give me your foot,” I said. 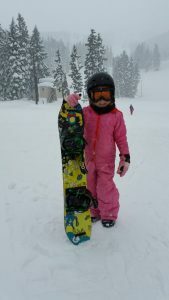 I looked up at Emma, dressed in a pink snow suit with a little black helmet covering about 95% of her blonde hair and wondered if she would like snowboarding. She lifted up her boot and I put it in the binding and strapped her in. She nodded and then pushed off. I thought she would fall after a few feet but she just kept going… another 10 feet, then 20 and finally after about 30 feet she crashed! I had to run full speed just to keep up with her. As I ran I was laughing because I was so happy and so proud of my little girl! We rode the “Magic Carpet” conveyor belt up about 7 more times before I finally suggested we take a break and go eat in the lodge. By that time Emma was begging me to take her on “the big hill.” I told her next time. It was so much hanging out with my little girl today. When I got back to the cabin I got a little reflective and felt grateful for the fact I was free to take 3 days off in the middle of the week to go hang out in a cabin with my family. There was no boss I had to request “time off” from. And I didn’t have to worry about not having enough vacation days left or anything. We just decided to do this recently and did it. It’s been hard running my own business. I won’t lie. I’m not sitting on the beach (or in a cabin) sipping cocktails all day. When I work, I work hard. I’m focused and I take what I do seriously. But now I’m also working on taking fun seriously too. So whether it’s a 2-month RV trip to Southern California or a 3-day snowboarding trip, I’m learning to make time for vacations and creating memories with my family. Otherwise, I may as well go back to the 9–5. …OK, now time to go, I see my kids have just broke ground on a new gingerbread house and it looks like they need some help with the framing.